As mentioned in our previous email, David and I made contact with our workaway hosts - or rather, our new friends Jean-Pierre and Sian, through a website called Workaway.info. It was the first time all of us had used the workaway scheme, and for both sides it's turned out really well - so much so that our one-week "trial" turned into a three-week stay and a prospective rendevous before we leave Europe in August! Jean-Pierre and Sian live in a lovely spot called La Source Bleue, which means 'The Blue Spring'. The incredible blue and turquoise spring is part of the property where Jean-Pierre grew up. There are four limestone buildings around the spring, which operated as a watermill back in the 11th century. The buildings have long since been converted into luxury accommodation and a restaurant. La Source Bleue has been in Jean-Pierre's family for 300 years and he and Sian ran the hotel and restaurant there for 30 years. They now rent the hotel as a gite or a holiday home (although it seems weird to describe an ancient stone mansion which sleeps 16 people comfortably, has a massive living area and three outdoor spaces, simply as a 'holiday home'). We should also mention that the gite comes with a pool, an extensive bamboo forest, and a massive pond with it's own little arch bridge. La Source Bleue also used to be a stop for pilgrims embarking on the Camino de Santiago (known as 'The Way of St James' in English) on their way down through the Pyrenees and into Spain. No doubt many different people from all walks of life have visited this little place over the decades. One week before our arrival on their doorstep, Jean-Pierre and Sian had just returned from eight months of travelling through Morocco and much help was needed to prepare the gite and garden for the summer guests arriving in July. Eight months with no maintenance had left the place pre-tty overgrown, so David and I were set to work ripping ivy off walls, weeding gardens, trimming trees, mowing lawns, raking leaves, grass and more leaves, and replacing tiles around the swimming pool. Oh and loads of waterblasting! Temperatures were consistently in the late 30's, and we had to dodge the likes of grass snakes, Asian hornets, lizards, stinging nettle (although we couldn't really dodge it, cos we had to rip it out) so all of this made us greatful for our pretty harmless creepy crawlies back home and less-intense temperatures. Some afternoons it would get so stiflingly hot, and the air felt so heavy, that we'd suddenly hear loud rumbles of thunder and rain would pour down for all of five minutes, clearing the air before the sun resumed shining. It was pretty random to us, but apparently it's quite common in the summertime for this to happen. We really did enjoy working in this amazing environment, but it was the most satisfying thing to hear the church bells down the road sound at 1pm signalling the end of our working day, at which point we'd dive into the pool to cool off, before sitting down to an amazing lunch prepared for us by Sian. Touzac is located in the Lot Valley, which is a landscape of canyons and cliffs carved out by the Lot River. There's a stretch of about 80km which zig-zags along the riverside from one end of the valley to the other. It's a really beautiful drive, if not a little hair-raising for the person in the passenger seat nearest to the jagged cliff walls! There are a number of villages along the river including St-Cirq-La Popie, voted 'France's most beautiful village' located on the crest of a steep cliff. It's a really photogenic spot, with red-roofed houses and a stunning view from the ruined chateau at the top of the village. There are loads of cute artisan stores and pottery studios lining the street corners. Another little village worth a visit is Puy l'Eveque, which used to be one of the most important medieval ports along the Lot River. Believe it or not, it was in this little village that we bumped into Kiwi Number 2 on our French visit: another chef, David O'Donogue who hails from Kaitaia. David has opened a restaurant called 'Cafe Pukeko' in Puy l'Eveque, serving the likes of fish and chips, kiwi style hamburgers (without beetroot though, tut-tut) steak, and pavlova. Jean-Pierre and Sian took us there as a Friday night treat, and it was so surreal to be eating fish and chips in such a French setting i.e. on a canvas-covered terrace, surrounded by potted geraniums, overlooking the river lined with limestone buildings... but hey, they tasted just as good as the fish and chips back home, so we weren't complaining! 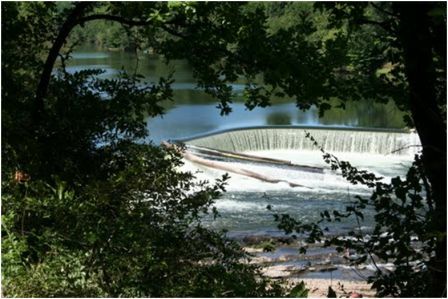 Above the Lot Valley is the region of Dordogne, similarly named after it's main river, the Dordogne. The river marked an important strategic frontier between the English and French during the Hundred Years war. The Dordogne region is so pretty and so tranquil these days that you would have no idea of the fighting that went on there if it weren't for the structure of the fortified villages and bastide towns it's famous for. 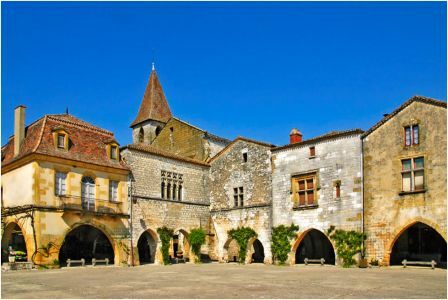 The bastides were towns occupied by the English and their layout and architecture is very distinctive; they're typically encircled by defensive walls, and have a grid structure of arrow-straight streets leading to a market square lined with arcaded walkways made of yellowstone. Our favorite bastide was Montpazier; we visited a couple of times to wander around and check out the antique market in the main square. It's hard to believe that it had been a place that witnessed such turbulence in its past, as the atmosphere is so peaceful and chilled out now. 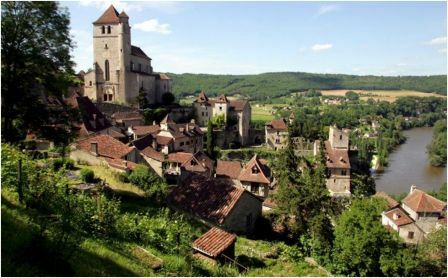 Rocamadour is a good example of a fortified village; similarly to when we first glimpsed Mont St-Michel in Normandy, it really took our breath away when we first saw it looming ahead of us. The village is literally built into the side of a steep cliff, and has been a place of pilgrimage since the middle ages. The Dordogne is also famous for it's foodie traditions such as foie gras, truffles, and anything made from walnuts (including wine). Stallholders at the markets basically force you to sample their wares, so at the famous Saturday morning market at Sarlat David and I got to try all sorts of goodies. (Unfortunately the truffle season is in March, so we didn't get to try them this time round.) Just a note, do not make the same mistake I did of comparing foie gras to regular paté, as French people will be offended. Foie gras (fattened goose or duck liver) is far superior! Another thing you can do in both the Lot Valley and Dordogne is kayak down the rivers - a really good way to appreciate the beautiful villages dotted along the riverside and up in the cliff faces. Our overall highlight was the experience of living with a French family for a couple of weeks. We learned so much about the French culture in that time and have friends we can keep in touch with and hopefully visit again one day. We thoroughly recommend the workaway scheme, especially if you are travelling for a decent chunk of time. Just make sure you know the expected hours of work before you arrive - our young Finnish friend Riina, who joined us at La Source Bleue during our last couple of days there, spent her first workaway stint at a guesthouse working from 8am to around 10pm, 7 days a week. Not cool!